This past December, we were visiting family in Portland and happened to find this newspaper clipping laying on the kitchen counter. Ryan’s mom is always cutting out new recipes, and she was excited to try this one with us. What’s really great about this pasta is that it’s made up of ingredients that may be in your kitchen right now, just waiting to be made into a delicious meal. This dinner has quickly become one of our favorites, especially since the entire dish uses just one pot and can be made in under 30 minutes. 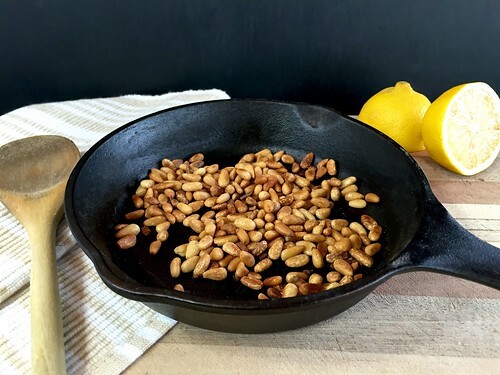 You begin by roasting pine nuts in a skillet, tossing and toasting them until golden brown and rich in flavor. While they are cooling, you sauté four cloves of minced garlic in a tablespoon of herb-infused oil from a jar of sun-dried tomatoes before adding the tomatoes themselves. 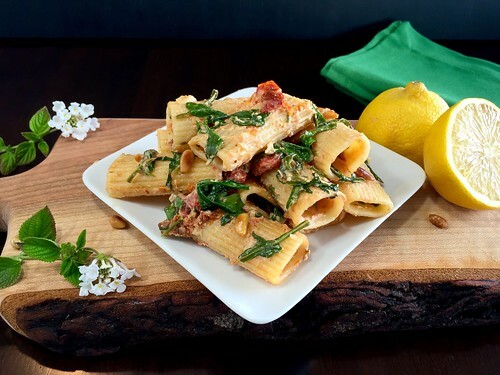 And finally you stir in fresh arugula, the toasted pine nuts, a splash of lemon, grated parmesan, and a slip of cream cheese which adds a hint of smoothness. 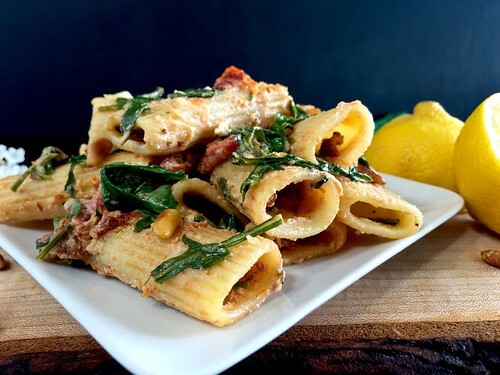 We made only a few adjustments to the original recipe by using rigatoni instead of penne and increasing the garlic. We also doubled the arugula which not only adds a bold peppery flavor, but also healthy vitamins and antioxidants. This colorful and delicious pasta is a go-to dinner, and proves that gourmet meals can be simple and quick to make from ingredients that might already be in your pantry. 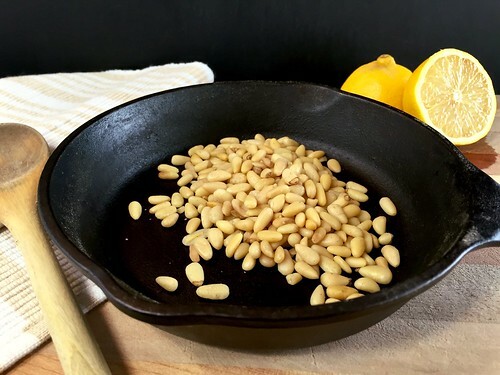 In a small dry skillet over medium heat, cook the pine nuts until toasted and golden brown, stirring often, about 5 minutes. Place nuts in a bowl to cool, and set aside. In a large pot, bring 3 quarts of water and 1 tablespoon of salt to a boil. When boiling, add the pasta and cook until al dente, following package directions. When the pasta is done, reserve 3 tablespoons of water, then drain the pasta and leave it in the colander. Return the empty pot to medium heat, then add the oil from the jar of sun-dried tomatoes and the minced garlic. Cook until fragrant, about 30 seconds, then add the sun-dried tomatoes and the diced tomatoes in purée. Cook for 1 minute, stirring constantly. 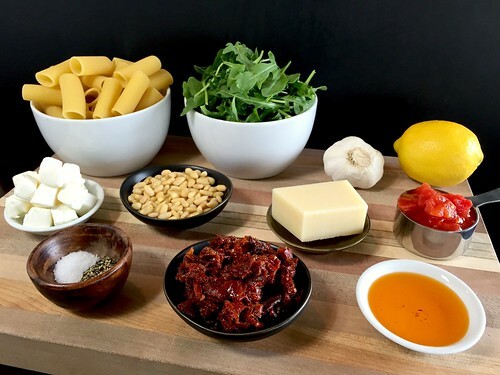 Then add the reserved pasta cooking water, the cooked rigatoni, the toasted pine nuts, cream cheese, lemon juice, arugula, parmesan, salt, and black pepper. Toss thoroughly to coat pasta in the sauce. Serve hot. Sounds delicious. I am going to give it a try. Thanks so much Lindy! It’s such a simple recipe, and so flavorful! We hope you enjoy every bite! I was wondering what brand of rigatoni is being used in the photo? It looks much wider than anything I see on the market today. It looks like the rigatoni my mom made when I was little.